Jordon Crawford sees no reason why Corby Town can’t go on a winning run between now and the end of the season. The popular forward hit a hat-trick, his first at Steel Park, as the Steelmen ended a run of three games without a victory with a 5-2 success over bottom side North Leigh last weekend. Corby head into the final seven games of the regular campaign sitting six points behind leaders Bromsgrove Sporting and five adrift of second-placed Peterborough Sports, who have two games in hand. 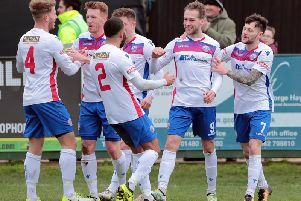 The Steelmen are now gearing up for a huge clash at Bromsgrove this weekend and they will be looking to pick up a third win over them this season having won 3-1 there in the Buildbase FA Trophy before thrashing their fellow high-flyers 6-0 at Steel Park back in October. A victory this weekend would keep Corby in the title hunt although they would need to follow that up with more wins to stay in contention. Asked if a winning run between now and the end of the season is possible, Crawford said: “I don’t see why not, we are more than capable. “We have already shown we can beat the top teams and we know we can beat the sides around us. We just have to take each game as it comes. “I think we needed that game (against North Leigh) to take us into the next one and the confidence is good. Last weekend’s hat-trick made it 14 goals in all competitions for Crawford this season. And he was delighted to make his mark at such a crucial time of the campaign. “It’s the first one for me at Steel Park and it has been a long time coming,” he added. “I am just grateful and thankful that is has come now going into the final stages where it means the most. Boss Steve Kinniburgh was pleased with Crawford’s contribution last Saturday and believes his impact on the game bodes well for the run-in. 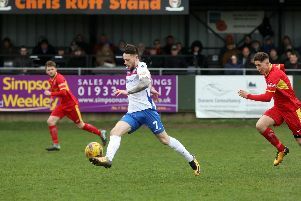 The Steelmen manager said: “If this is now going to be the Jordon Crawford that we have seen glimpses of this season and what we saw plenty of last season then it bodes well. “For him to come into this period of the season understanding what he needs to do to be the key part of the team that we know he can be is great."